Pipe bursting is a simple process which allows the rehabilitation of circular pipe sections with reduced delivery rate or load-bearing, or broken sections, on the same path, even with larger diameter, without open trench. 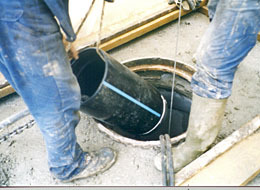 Before execution, video camera inspection in the sewer and soil investigation are required. Two shafts are necessary for the technology (manhole or working shaft).Description of the process: the old pipeline section can be rehabilitated on the same horizontal and vertical path, with the same or larger diameter, using pipes with more favorable hydraulic parameters. 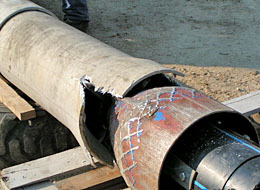 If the internal diameter of the pipeline to be rehabilitated is lower than 300 mm, the rehabilitation process can be executed from an existing manhole of at least 1000 mm of internal diameter. If the dimensions or conditions of the existing manholes are not appropriate for this option, a separate working shaft with shoring shall be constructed. In these working shafts, the larger equipment, used to burst damaged pipelines of diameter higher than 300 mm, can also be installed. 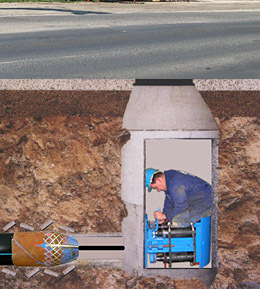 Pipe bursting technology has only a minimal impact on the existing environment and the road traffic. Its application is not weather-dependent, it can be used in winter too. 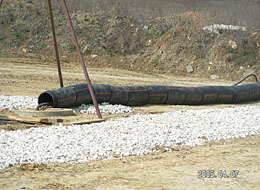 It is significantly quicker than the open trench method: when working shafts and the jobsite is ready, the rehabilitation of 100 m pipeline over 400 mm diameter takes only 4 days, while rehabilitation of 50 m pipeline under 300 mm diameter takes 2 days. If groundwater is present, dewatering is only necessary in the working shafts.